Grass grows at different rates through the year, depending on temperature, moisture and soil nutrients. When all else is equal, we see a peak in grass growth in June (long days, plenty of sun, moisture still in the ground from the spring rain), a dip in August and another slight rise in September with autumn rain, then it is downhill all the way! Grass cannot grow at all when the soil temperature is below 6 deg. 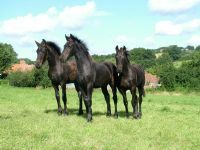 C.
In good conditions in June, grass will be growing to produce around 30kg of dry matter per acre which will support 2 – 3 horses. In winter, it could be down to 1kg per acre, so you would need 10 acres to support just one horse. Last summer, in the very dry weather in the summer, grass growth was down to around 5kg per acre, so one horse would need over 2 acres. No wonder so many horses needed to be topped up with hay! The September flush was also very disappointing, being about 1/3 below average. These figures have been adapted from information on the AHDB (Agricultural and Horticultural Advisory Board) website.